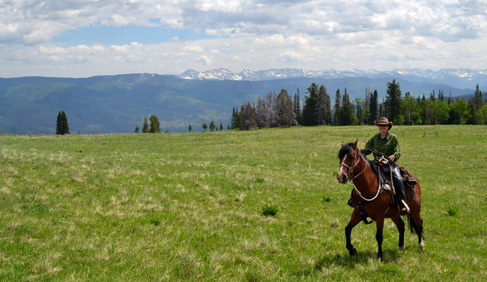 Bearcat Stables offers Colorado horseback riding adventures for the entire family, from one hour to four days, in the beautiful Rocky Mountains of Colorado a half hour from Vail and around two hours from Denver. 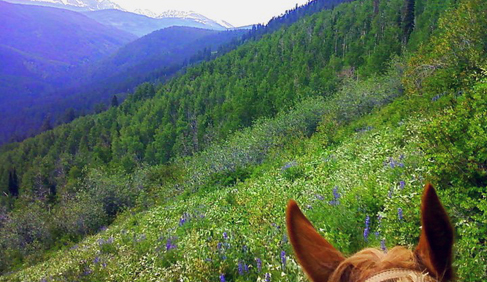 Ride wildflower covered meadows and catch glimpses of elk, deer and circling hawks moving through aspen stands. Book a short, hour long or two hour ride near the ranch or head into the back country, spending from three to six hours in the stunning terrain - even add a gourmet lunch along the way if you'd like! Overnight and multi-day trips are also available and make the perfect family or business retreat. 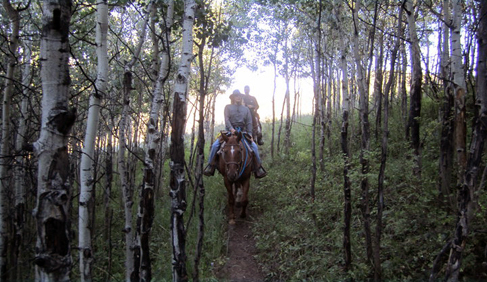 Each backcountry ride is customized to match your idea of a great Colorado horseback adventure! Winter Horsedrawn Sleigh Rides with Dinner and Carriage Rides, popular for weddings, are also on offer. 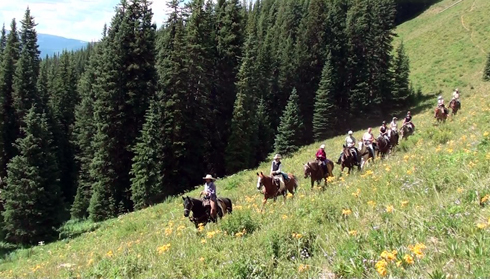 The Pack Trip Experience: Riding a horse from Vail to Aspen will be one of the most memorable journeys you ever make. 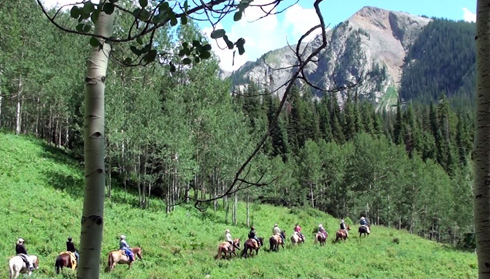 This four day, three night horseback riding trip crosses some of the most spectacular backcountry in Colorado. Vail to Aspen trips are limited to ten guests. Check this year's availabe dates. Meet chef Adam Weinberger and view our trip menu. Read the august 2012 article in Food and Wine Magazine. 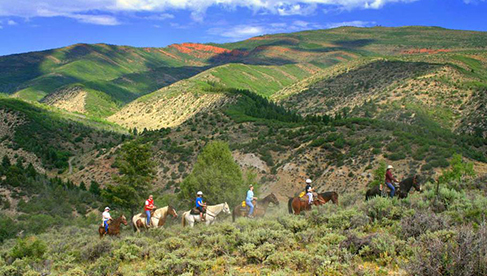 Riding Level: This horseback tour is suitable for riders of any level. 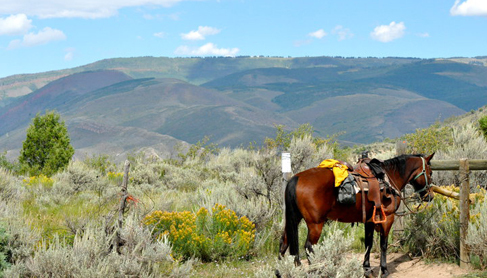 Gentle horses and easily navigable terrain make the trip possible for beginners, while the stunning scenery and backcountry nature of the area make it an adventure for even the most experienced of horse people. Certainly the amount of time to be spent in the saddle must be taken into account, especially for those unaccustomed to riding on a regular basis. 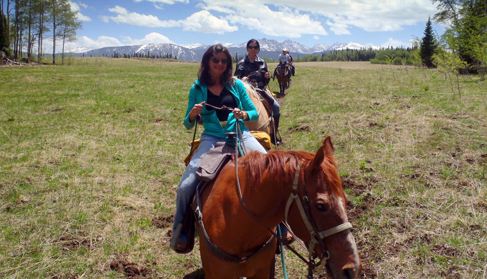 Bearcat Stables highly recommends that you ride before this Colorado horseback riding tour, if only to prepare the old seat bones for the journey. 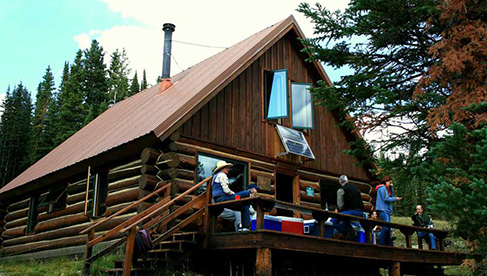 Accommodations: The first and third nights on the trail will be spent in Tenth Mountain Division Huts. These beautiful, cabin-like structures are always a welcome and surprising sight at the end of a day's ride. Both huts are nestled in the woods with beautiful decks overlooking spectacular vistas - the perfect place to unwind after stepping off your horse. 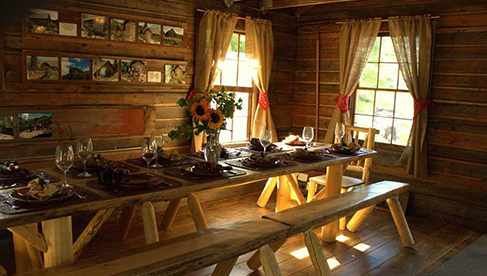 The interior of each of the huts is cozy and comfortable, and set up for communal living. The second floors are sleeping quarters, with everyone sharing one large sleeping room. Each individual sleeping area is equipped with a sleeping pad (very comfy) and a pillow. You only need to bring your own sleeping bag, and if you like, pillowcase. The second night on the trail is a brush with civilization, as we ride into the Fryingpan River valley and spend the night at a beautiful guest ranch. Hot showers and flush toilets await trail-weary bodies. If you'd like you may even have an opportunity to see the news and hit the hot tub before heading back out into the wilderness. Food: All meals while on the ride will be provided for you. This means a total of three cooked breakfasts, four lunches on the trail, and three dinners. Trail snacks (i.e. 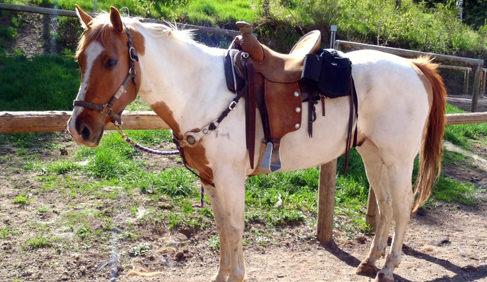 candy, granola bars, and fruit) and drinks will be made available for you to have on your horse with you during the day. Bearcat Stables will do their best to accommodate any special requests you might have, as long as you tell them about these well in advance of the trip. Breakfasts and dinners are always hot meals and freshly prepared. Lunch will be eaten on the trail each day and usually consists of sandwiches or wraps, chips, fruits, cookies, and drinks. Bearcat Stables is very proud of their menus, as they feel they are delicious, healthy and fun. Each trip’s menu is different depending on guest’s requests, so let them know if there’s something you’d particularly like. 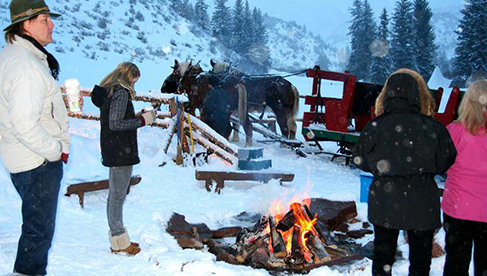 Daily Horseback Trail Rides, Weddings, Private Parties & Group Events, Winter Horse Drawn Sleigh Rides, Short Riding Vacations, Western Horse Riding, Pack Trips, Hunt Camps and Packing Services, Advanced Backcountry Horse Rides, Carriage Rides. 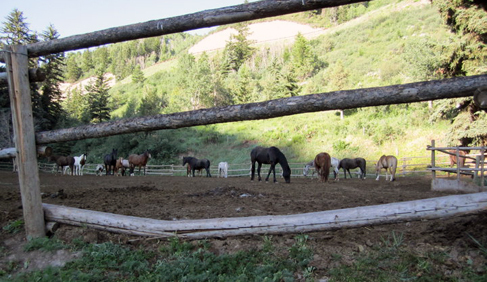 Bearcat Stables offers horseback riding tours and trips for all abilities in an Old Western Rocky Mountain Ranch Atmosphere. Just outside of Vail, Colorado. 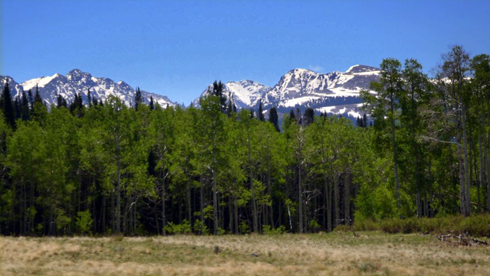 Vail-Eagle Airport is only about twenty minutes away. Denver Airport– about a two hour drive from the stables.